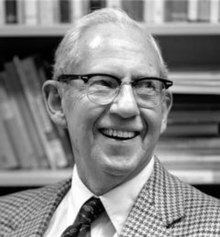 George Joseph Stigler (/ˈstɪɡlər/; January 17, 1911 – December 1, 1991) was an American economist, the 1982 laureate in Nobel Memorial Prize in Economic Sciences and a key leader of the Chicago School of Economics. Stigler was born in Seattle, Washington, the son of Elsie Elizabeth (Hungler) and Joseph Stigler. He was of German descent and spoke German in his childhood. He graduated from the University of Washington in 1931 with a BA and then spent a year at Northwestern University from which he obtained his MBA in 1932. It was during his studies at Northwestern that Stigler developed an interest in economics and decided on an academic career. After he received a tuition scholarship from the University of Chicago, Stigler enrolled there in 1933 to study economics and went on to earn his Ph.D. in economics there in 1938. He taught at Iowa State College from 1936 to 1938. He spent much of World War II at Columbia University, performing mathematical and statistical research for the Manhattan Project. He then spent one year at Brown University. He served on the Columbia faculty from 1947 to 1958. At Chicago, he was greatly influenced by Frank Knight, his dissertation supervisor. Milton Friedman, a friend for over 60 years, commented that it was remarkable for Stigler to have passed his dissertation under Knight, as only three or four students had ever managed to do so in Knight's 28 years at Chicago. Stigler's influences included Jacob Viner and Henry Simons as well as students W. Allen Wallis and Friedman. Stigler is best known for developing the Economic Theory of Regulation, also known as capture, which says that interest groups and other political participants will use the regulatory and coercive powers of government to shape laws and regulations in a way that is beneficial to them. This theory is a component of the public choice field of economics but is also deeply opposed by public choice scholars belonging to the "Virginia School," such as Charles Rowley. He also carried out extensive research in the history of economic thought. Stigler's most important contribution to economics was published in his landmark article, "The Economics of Information." According to Friedman, Stigler "essentially created a new area of study for economists." Stigler stressed the importance of information: "One should hardly have to tell academicians that information is a valuable resource: knowledge is power. And yet it occupies a slum dwelling in the town of economics." His 1962 article "Information in the Labor Market" developed the theory of search unemployment. In 1963 he was elected as a Fellow of the American Statistical Association. He was known for his sharp sense of humor, and he wrote a number of spoof essays. In his book The Intellectual and the Marketplace, for instance, he proposed Stigler's Law of Demand and Supply Elasticities: "all demand curves are inelastic and all supply curves are inelastic too." The essay referenced studies that found many goods and services to be inelastic over the long run and offered a supposed theoretical proof; he ended by announcing that his next essay would demonstrate that the price system does not exist. Another essay, "A Sketch on the Truth in Teaching," described the consequences of a (fictional) set of court decisions that held universities legally responsible for the consequences of teaching errors. The Stigler diet is also named after him. Stigler wrote numerous articles on the history of economics, published in the leading journals and republished 14 of them in 1965. The American Economic Review said, "many of these essays have become such well-known landmarks that no scholar in this field should be unfamiliar with them.... The lucid prose, penetrating logic, and wry humor... have become the author's trademarks." However, economist Deirdre McCloskey later referred to Stigler as "among the worst historians of economic thought in the history of the discipline" who "read a lot but was defective in paying attention." Stigler was a founding member of the Mont Pelerin Society and was its president from 1976 to 1978. He received National Medal of Science in 1987. ( 1994). Production and Distribution Theories: The Formative Period. New York: Macmillan. Preview. (1965). Essays in the History of Economics. University of Chicago Press. 1965. ^ National Academy of Sciences; Office of the Home Secretary (1 May 1999). Biographical Memoirs. National Academies Press. pp. 342–. ISBN 978-0-309-06434-7. ^ a b Milton Friedman (1992). "George Joseph Stigler January 17, 1911 – December 1, 1991," Biographical Memoirs. National Academy of Sciences. ^ Palda, Filip. A Better Kind of Violence: The Chicago School of Political Economy, Public Choice, and the Quest for and Ultimate Theory of Power. Cooper-Wolfling Press. 2016. ^ George J. Stigler (1961). "The Economics of Information," Journal of Political Economy, 69(3), pp. 213–25 Archived 2010-06-21 at the Wayback Machine. ^ George J. Stigler (1962a). "Information in the Labor Market." Journal of Political Economy, 70(5), Part 2, Oct., pp. 94–105. ^ George J. Stigler, 1973. "A Sketch of the History of Truth in Teaching," Journal of Political Economy, 81(2, Part 1), pp. 491–95. Diamond, Arthur M., Jr. (2005). "Measurement, Incentives, and Constraints in Stigler's Economics of Science." The European Journal of the History of Economic Thought 12, no. 4637–63. Freedman, Craig (2003). "Do Great Economists Make Great Teachers? George Stigler as a Dissertation Supervisor," Journal of Economic Education, 34(3), pp. 282–90. Friedman, Milton (1993). "George Stigler: A Personal Reminiscence," Journal of Political Economy 101(5) pp. 768–73. _____ (1998). "George J. Stigler, 1911–1991. A Biographical Memoir. Hammond, J. Daniel, and Claire H. Hammond, ed. (2006). Making Chicago Price Theory: Friedman–Stigler Correspondence, 1945–1957. Routledge. 165 pp. ISBN 0-415-70078-7. Levy, David M., and Sandra J. Peart. (2008). "Stigler, George Joseph (1911–1991)." The New Palgrave Dictionary of Economics, 2nd Edition. Abstract. Palda, Filip (2016). A Better Kind of Violence: Chicago Political Economy, Public Choice, and the Quest for an Ultimate Theory of Power. Cooper-Wolfling Publishers. ISBN 978-0-9877880-7-8. Steelman, Aaron (2008). "Stigler, George J. (1911–1991)". In Hamowy, Ronald (ed.). The Encyclopedia of Libertarianism. The Encyclopedia of Libertarianism. Thousand Oaks, CA: SAGE; Cato Institute. pp. 492–93. doi:10.4135/9781412965811.n299. ISBN 978-1-4129-6580-4. LCCN 2008009151. OCLC 750831024. "Stigler, George Joseph" by Peter Newman, v. 4, p. 498. "Stigler as an historian of economic thought" by Thomas Sowell, v. 4, pp. 498–99. George J. Stigler (1911–1991). The Concise Encyclopedia of Economics. Library of Economics and Liberty (2nd ed.). Liberty Fund. 2008. George Stigler's seminal studies of industrial structures, functioning of markets and causes and effects of public regulation. This page was last edited on 6 March 2019, at 18:14 (UTC).